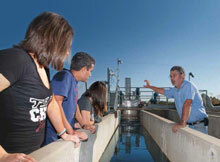 Welcome to the CSU, Chico Master of Science in Agricultural Education program. If you are searching for a fully accredited, graduate degree in agricultural education, you’ve found the right program. The online MS in Agricultural Education is specially designed to address the higher education learning demands of high school agricultural education teachers, science educators, and associated professionals who administer agricultural education programs. CSU, Chico College of Agriculture offers the program in partnership with AG*IDEA, a national consortium of accredited universities offering courses in the agricultural disciplines. The program is designed to be completed in two years, with courses originating from Chico and the consortium universities. This flexible format provides you convenient, online access to the top graduate educators and researchers in the nation. The Master of Science in Agricultural Education is a 30 unit graduate program allowing up to 9 transfer units. The culminating activity can be in the form of a thesis, project, or exam. Fees for fall 2018 will be $580 per unit. Click the link in the Course column you wish to enroll in below. 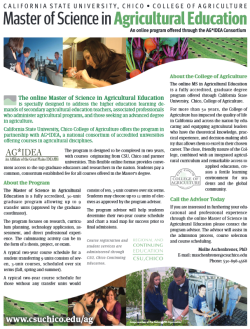 If you are interested in furthering your educational and professional experience through the online Master of Science in Agricultural Education, you are invited to contact the program advisor. She will review your transcripts and guide you through the admissions process. For course and faculty information, program requirements, and the application process, visit the CSU, Chico College of Agriculture’s Masters in Agricultural Education Website. 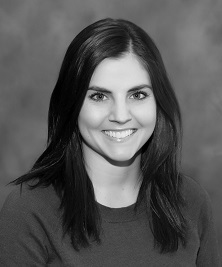 "The MS Ag Education program at Chico State was a great experience. It's a good option for teachers who want to pursue a master's degree without the expense of relocating or taking time off work. The online classes are relevant for me as an educator and the pacing of the program was just right."